Rigging is an important part of working in a shipyard or on a vessel. Workers who implement rigging use ropes, chains, cables, cranes and other hoisting materials to support their loads. Unfortunately, employers who do not take proper precautions expose riggers to many hazards, causing injuries such as crush accidents, amputations, falls, electric shock or death. The Occupational Safety and Health Administration (OSHA) published a Safety and Health Injury Prevention Sheet (SHIPS) for rigging that outlines what maritime employers need to do in order to protect their workers from rigging injuries. OSHA’s SHIPS describes how workers can be exposed to certain injuries when rigging. It outlines specific cases of workers who were injured or killed in the past while rigging and explains how these incidents happened, as well as how these incidents were preventable. For example, in Case History #1, a worker used a wheel-mounted crane to reposition exhaust stacks. The worker placed an exhaust stack on its side and leaned the other against it. When the worker slackened the line so a rigger could move the rope, the entire stack fell over and struck the rigger’s head, killing him. According to OSHA, this could have been prevented if the operator made sure the drop position was secure and chocked. The SHIPS stresses how it is necessary for employers to make sure riggers are properly trained, qualified and familiar with the gear. Workers must also be constantly aware of where the equipment is so they may react quickly if an issue does arise in addition to being able to stop the job at a moment’s notice if they suspect unsafe conditions. The online SHIPS has links to other maritime standards, as well as information for outreach training programs for both employers and workers. OSHA administrators say employers who abide by the SHIPS guideline provide a healthy work environment for their rigging employees. 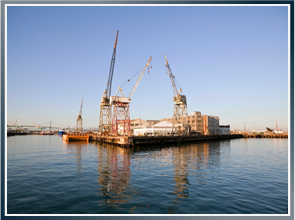 What Should I Do if I was Injured in a Rigging Accident? According to maritime injury attorney David Anderson, you should always seek quality medical attention after an accident. Next, you must immediately contact an attorney to understand your rights in the situation. Your employer and their insurance company will investigate the circumstances of your accident and it may be necessary to have an attorney present to ensure your rights are not being violated.